Congratulations, you’ve just completed your first 26.2-mile race! Less than 5% of the population has run one of their own so you’re certainly part of an elite club. So congratulate yourself on what you’ve achieved and have some fun because the road to recovery can be a painful one! After running your first marathon, you’re most likely scouring the internet (hence why you’re here) looking for articles on how to make the pain in your legs go away. 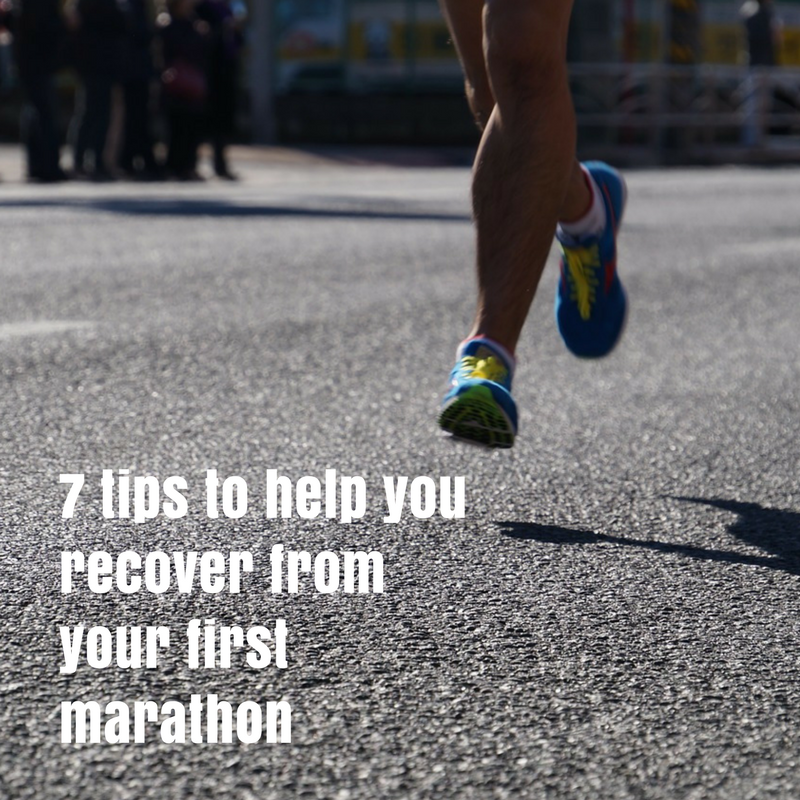 But whilst you may be walking like a zombie, there are a couple of things that you can do to speed up the recovery process. Immediately after the race, it’s important to start the refuelling process. Running a marathon is a huge physiological challenge and your body’s stores will be depleted. If you want a treat or two after the race, by all means, go ahead, you deserve it. Just try and include the following with a few beers down the pub. In the hour after you have finished, you’ll want to consume some carbohydrates. We call this the ‘window or opportunity’ because it’s the time that your body is most receptive to nutrients after everything has been depleted. Nutritionist Emma Stevenson explains, “This is because of the restoration of muscle and liver glycogen – the carbohydrate stored in the muscle and liver that are depleted during prolonged exercise – begins as soon as exercise ceases so carbohydrates are essential to maximise this process”. Sports drinks, cereal bars, bread or bananas are all quick and easy bites that you can get your hands on before you hit the bar. You’ll want to get some fluids down you as quickly as possible too. You body’s cells will be seriously dehydrated and their ability to transport nutrients will be impaired. Start drinking immediately after you finish but this is something you’ll want to monitor over the next couple of days as well. You’ll most likely have lost a couple kilos from the race just in water weight, especially if it was a hot day. For every kilogramme of weight lost, you need to drink a litre of fluid during the days that follow to bring yourself back to normal. Great way to check your fluid levels is by checking your urine to see if it’s clear. If it’s yellowish, take on some more fluids. There’s a lot of debate regarding ice baths and their effectiveness. Put us in the pro ice bath section. If your body is beaten up, and after a marathon it certainly is, an ice bath can help to sooth those inflamed muscles. Fill a bath with water so that your legs will be fully submerged when you get in. Then fill it with ice of course! You’ll want to sit there for about 15 minutes, don’t worry it does get easier after the first couple of minutes! If the cold is too much for you to bear, there is another way to ease yourself in. Get in the water in the bath first and get in before you put the ice in. Once you’re in the bath, then you can add the ice. This means the water will get colder gradually. Take note that you will need an extra 10 minutes or so to get the same effect, so about 25 minutes in total with this method. So now you’ve refuelled and had yourself an ice bath. I promise the next phase is easier than the last one! Since you’ve earned a good sit down, you’ll want to do so with your legs elevated. If you can bear it, get them as high as possible. I’m a big fan of lying on the sofa with a large pile of cushions underneath my legs so that they are much higher than my hips and torso. The goal here is to facilitate the return flow of blood to the heart, allowing your body to effectively process the damage you have done whilst running. You can enhance this process by wearing some compression tights or socks whilst you’re relaxing. If you don’t have any lying around, you should be able to find medical versions at your local pharmacy. Just like the ones that you wear during an operation, same principles apply. Trust me, it works. This applies not only to the immediate post-race recovery but also for the days that follow. Sleep is one of the most effective forms of recovery! This is the time where your body heals itself so make sure you give yourself at least 8 hours to maximise your chances at a swift recovery. Make sure you’re well hydrated before you go off to sleep and keep those compression tights or socks on too for added effect. The morning after the big race you’re going to feel DOMS (delayed onset muscle soreness) like never before. Your body is still going to be pretty beat up, so it’s important not to over-do anything during this period. You’re going to want to try and get the blood moving around your body again so it can continue the recovery process. One of the best ways to do this is to do a little light activity. A walk around the park or a trip to the pool to do some wading is perfect to keep the blood moving. As the title says, keep it light. You may also want to do a little bit of stretching as well. Again, keep it gentle as your muscles are still damaged. If your legs are feeling really tight, you could always opt for a light massage. Stay away from deep tissue massage, save this for about 4 days after the race when you have had a few extra days to recover. Eating lots of protein, carbohydrates and fruits is another important phase of recovery. You need the protein and carbs to help your muscle tissue to recover from the race. Food is your fuel and you need to refill the tank. Your immune system will have also of kicked into overdrive during and after the race to cope with the stress in your body. This is why it’s great to keep topping up with fruit and a healthy dose of vitamin C and antioxidants to get you run ready again. My favourite, any excuse for an Epsom salt bath! Give your legs a good, but gentle rubdown before bed and fill yourself a warm bath filled with Epsom salts. After about 15 minutes in there, you’ll feel great! There is a lot of debate surrounding the science and effectiveness of Epsom salt, but I’m a strong believer of ‘If it works, do it’. Even if it is the placebo effect working, at least it’s doing its job! Ultimately, recovery all comes down to the individual. What may work for one person, won’t work for another. And to be brutally honest, if this is your first marathon, you’re going to feel it for quite a few days after! The most important thing is rest, which is unanimously agreed upon. Just make sure you take it easy and refuel properly and you can’t go too far wrong. Let us know in the comments below how your recovery routine is put together.